Ty Trosclair, 17, of Grand Chenier, reeled in a STAR-tagged redfish on Rockefeller Wildlife Refuge on June 24. Pending a polygraph, he'll win a 21-foot NauticStar boat and Mercury outboard motor package. 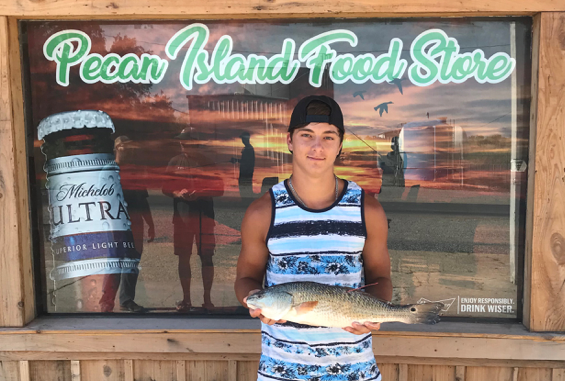 Life is made up of learning experiences, and last year Ty Trosclair got a tough one: He caught a tagged redfish, but wasn’t registered for the Coastal Conservation Association of Louisiana’s STAR Tournament. Fortunately, it was an error he didn’t make twice. On June 24, while trout fishing from the bank with his dad Scooter Trosclair and a friend on the Rockefeller Wildlife Refuge, the 17-year-old from Grand Chenier reeled in another STAR-tagged red — and this time, pending a polygraph, it will be worth a 2140 NauticStar and Mercury outboard motor package. “I wasn’t going to make that mistake again,” the younger Trosclair said in a press release. And it didn’t take long for the young angler to realize the fish was tagged. “That’s when I threw my pole down and went over to make sure Ty didn’t lose this one,” Scooter said. The fourth and fifth registered anglers to catch a tagged redfish also will win 2140 NauticStars with 150hp 4-stroke Mercury Outboards, while the sixth thru 10th anglers who catch a tagged red will win a brand new Gatortail boat, motor and trailer package. The Chevy Silverado and two NauticStar and Mercury boat packages have already been claimed, along with the $10,000 bonus prize from Louisiana Sportsman Magazine. The tournament goes until Labor Day, Monday, Sept. 3. Registration is only $35, but you have to be a CCA member to participate. To register, as well as see a complete list of divisions, weigh stations, sponsors and rules, click here.